Should Nintendo be looking at releasing an N64 Classic? Yes, if this year’s sales of the original 64-bit hardware are anything to go by. Sellers of vintage gaming hardware said they noticed a boom in Nintendo 64 sales this holiday season, a shift away from the previous generations of consoles that Christmas shoppers had coveted years earlier. Storeowners, online sellers, and repairmen I interviewed said that in the months leading up to Christmas, Nintendo 64s were hot commodities, especially among 25- to 30-year-olds who’d grown up with the system. “We easily sold over a hundred,” said Daniel Mastin, general manager of the independent store Video Games New York, as he stood in front of a glass showcase stacked high with Japanese Famicom cartridges and neatly arranged Game Boy Color boxes. Over the last few years, Mastin said he has noticed a slow movement away from the Super Nintendo Entertainment Systems that had dominated Christmas sales years ago at his New York City store. “This was the best year for the 64 to date,” he said. While we were chatting, the phone rang. The caller, who had just received an N64 for Christmas, wanted to know whether Video Games New York still had controllers. Originally released in 1996, the Nintendo 64 was a major milestone in gaming’s shift from 2D, sprite-based graphics into 3D polygons. While it was dramatically outsold by and had far fewer titles than the Sony PlayStation, marking the first dip in Nintendo’s dominance of the gaming industry, the Nintendo 64 still garnered a small library of true classics like Super Mario 64, The Legend of Zelda: The Ocarina of Time, and Goldeneye 007. Its four controller ports made it the go-to system for multiplayer gaming. Today, the kids who grew up with Nintendo 64 are looking to recapture their childhoods, and it’s a coast-to-coast craze. Josh Hamblin, a game collector and seller from Portland, Oregon, said he also saw a significant uptick in N64 sales, and he thinks it’s just the time for it. As inventories depleted during the holiday season, Hamblin raised the average price of his refurbished N64 units, which came with a console, one controller, and the necessary cables, from around $70 to $80 or even $85 each. That’s only about $120 less than their 1996 release price of $199. As the holiday season closed in, Hamblin spent more and more money to get inventory. He bought 15 Nintendo 64s from a fellow seller for $40 each, and sold them all for twice the price in just three days. The standard gray-colored launch model of the Nintendo 64 is the most common and least expensive model. If you want one of the candy-colored “Funtastic” versions that Nintendo released later—to say nothing of the edition with a plastic Pikachu embedded into the casing—be prepared to spend up to $150 or even more. 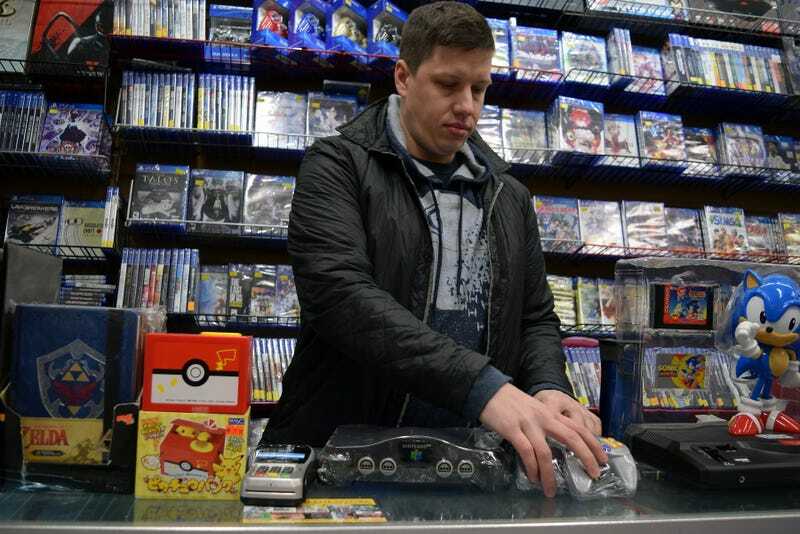 “I wish I had 15 or 20 more,” said Joe, the owner of another New York independent games store called 8-Bit And Up. Joe, who spoke with Kotaku on the condition that we not use his last name, sold out of the plain gray N64 consoles before Christmas, which, he said, 30-year-olds bought to give the gift of nostalgia. At one point, Joe received a console that “looked like someone shot a hole right through to the RAM expansion.” He held onto it after testing to see whether it worked. Shortly after, a customer came in, desperate for an N64 for Christmas, and eagerly bought it, hole be damned. Sources I interviewed say that the original PlayStation isn’t seeing the same renaissance. The reason is twofold, they say. First, the Nintendo 64 appears to be more durable and requires minimal work to refurbish, unlike the CD-ROM-based PlayStation and its easily scratched discs. Also, what millennial buyers are nostalgic for is the Nintendo 64’s local multiplayer experience: Mario Kart 64, Super Smash Bros., Mario Party. The early PlayStations didn’t as readily accommodate party gaming. Of course, to truly replicate that experience, you’ve also got to shell out for three more controllers at $15-20 a pop.